Richard Droker (wanderflechten@Flickr) of Seattle, Washington, provided us with this image taken in Zimbabwe of two Scadoxus multiflorus plants (via the BPotD Flickr Pool). Thank you Richard! The Amaryllidaceae spans worldwide and currently includes 73 genera and 1605 species (including yesterday’s Rhodophiala rhodolirion). It is common for members of this family to produce showy inflorescences from a single scape, and many are geophytes (growing from an underground storage organ, such as corms or bulbs). Scadoxus multiflorus is a rhizomatous perennial that produces a pseudostem–a stem-like structure that is composed of the tightly-bundled leaf bases. Originating in tropical Africa, the species contains three subspecies. Two of the subspecies found commonly in cultivation are subsp. multiflorus and subsp. katherinae; descriptions and photographs of these can be found via the Pacific Bulb Society’s Wiki: Scadoxus. A third subspecies, Scadoxus multiflorus subsp. longitubus is rare in cultivation and restricted to lowland rainforests from Guinea to Ghana (for more on many Scadoxus species, see Glorious Scadoxus (PDF) by Jonathan Hutchinson). Plants only produce a single inflorescence each flowering season, from December through March (late summer to autumn in the southern hemisphere). The species grows in a number of habitats ranging from mountainous areas to savannah grassland to woodland. 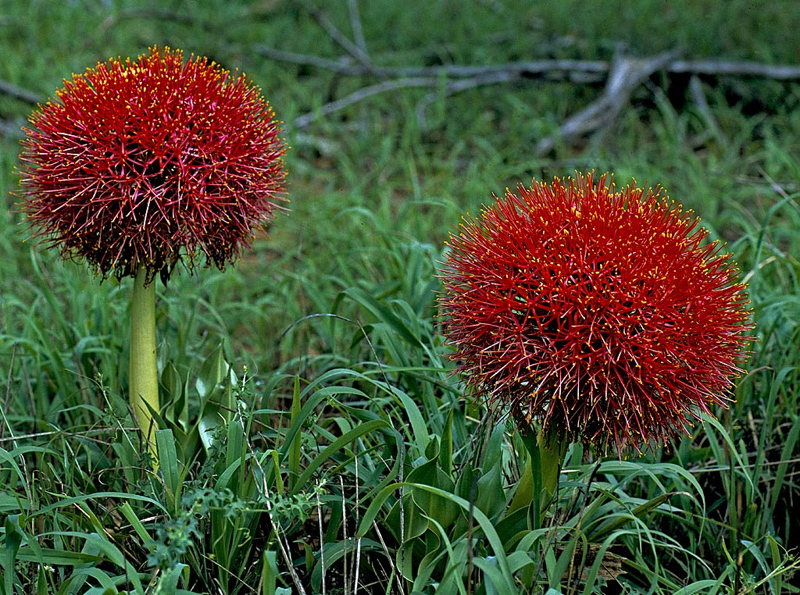 Scadoxus was previously placed in the genus Haemanthus (literally, “blood- flower”), but in addition to still being called blood-flower, it is also commonly known as “fireball lily”. Calling it blood-flower may be a bit misleading depending on your interpretation, since Scadoxus multiflorus, like all nine species of the genus, is very poisonous. Some indigenous peoples of Africa have uses for the poisonous alkaloids found throughout the plants, including treating water bodies to poison fish and coating arrow tips. It is known to be lethal to livestock, who may eat it when other food sources are scarce. Now that’s something different. Never heard of a pseudostem before, and it’s rhizomatous, not a bulb. Those mops of flower heads are spectacular. Between this and the last post, amazing flowers just pop up fully formed, no leaves. I need to think about this. I currently grow Scadoxus multiflorus subsp. katherinae as a houseplant and love the speckled “bulb,” (technically a swollen rhizome) and pseudostem as well as its leaves during the summer, fall, and some of winter. Every spring, (march or so) after a 2 month dormancy, the “bulb” makes a gorgeous inflorescence as well as a couple small rhizomes with new tiny “bulbs” at the end. This is followed quickly by the new foliage which lasts till January of the next year or so. Its been about 3 years since I acquired the “bulb” and it seems easier to grow and flower than Hippeastrums, of which I have 3. A lovely plant if you can find one. amaryllidaceae photos! The last two were wonderful! Looks like something from a Dr. Suess book!! I have 6 of the Starfire Lily plants in a large pot on my deck, one bloomed this year and was outstanding. If anyone could tell me how to winter this plant over I would be most greatful. I live in northwest Ohio where it gets below zero at times. I do not know if the plants will take well to just bringing them inside to a 72 degree temp. Thank you for any coments. Leave a Reply to elizabeth a airhart Click here to cancel reply.